Our new line of Teflon coated blades. TCS, short for a new industrial coating by DuPont that makes our blades run super fast, super smooth and super cool. • The coating makes these blades more resistant to friction and heat buildup. The blade stays up to 50% cooler than non-coated blades. This helps the wood glide by the blade with a lot less effort compared to conventional blades. So, you get some major benefits. • This puts less stress on the blade. Studies by DuPont tell us that TCS coated blades last up to 50% longer than conventional blades before sharpening. • It also causes less pull on the saw, 38% to be exact. Which translates into over 1/3 more cutting power. And as a bonus, the smoother cutting action means less wear and tear on the motor. • TCS blades won't bind like conventional blades. The self-lubricating, non-stick finish sheds sappy wood residue before it builds up. So you will get a smoother, more professional cot with TCS blades. • Clean up with these blades is also easy. Pitch and resins just don't stick well to the industrial Teflon. So, even after extensive use, simply wipe dean with hot water. • Don't be concerned about cleaning the blades with water. The Teflon coating makes the blade rust resistant, in fact, you don't need oils, greases or rust-preventatives. 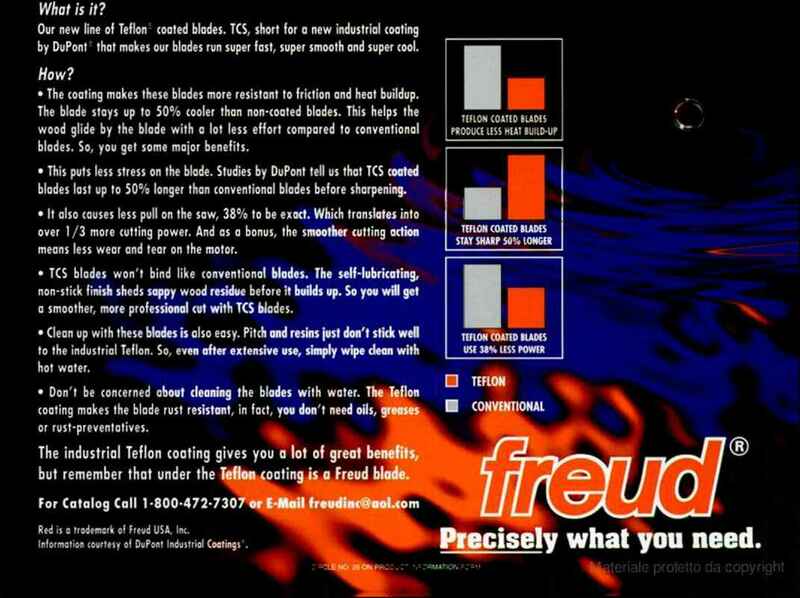 The industrial Teflon coaling gives you a lot of great benefits, but remember that under the Teflon coating is a Freud blade. Red ¡1 o frodimork of Freud USA. Inc. Information courtesy of DuPont Industriol Coatings .